When we think of Pandas we usually picture a giant black and white animal that and looks cute and cuddly but would steal the jacket off our back to use as a pillow. Rest assured not all Pandas are big, mean, thieves. 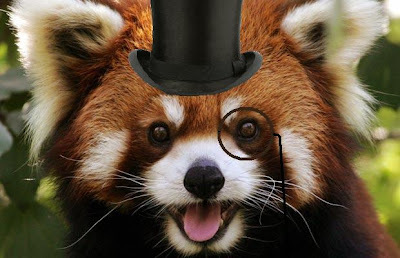 Consider for a moment the Red Panda, he is a true gentleman with a non aggressive playful disposition. Their relation to the black and white Giant Panda is in name only. The Red Pandas (Ailurus fulgens) are most closely related to Raccoon and Skunks, but don’t worry, they probably don’t smell as bad. To be honest though, I never sniffed one. This adorable creature is native to China and Nepal. The Red Panda measure about 45 inches (114cm) in length from head to tail, and weigh up to 14 pounds (6kg). These arboreal creatures dine mostly on vegetation, especially bamboo, as well as small animals. Like most other cool creatures Red Pandas are nocturnal and solitary. So if someone tells you there’s a Panda under your bed, don’t automatically become horrified, and reach for your Glock, it could be a sweet little Red Panda.